California artist, Felicia Renaud, was inspired by the idea of adding a mural to her high-school bedroom without painting on the wall. Renaud began hand-painting light-bulbs, hoping they would create the same effect. After much trial and error, Renaud developed a heat resistant and non-toxic glaze that paved the way for her Mood Lights. 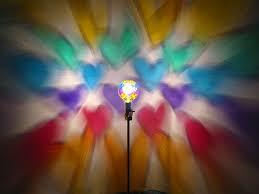 Mood Lights are colored light-bulbs with imaginative motifs and patterns. Renaud features a series of bulbs ranging from “Over The Rainbow”, “Clouds”, “Rainbow”, “Flames” and many more. The bulbs are for ambient light use only and are reusable as tree ornaments or suncatchers when the filter expires. They fit most fixtures and work under white lampshades: 25-watt bulb, 2,500 hour lifespan or 3-5 years with 8 hours of daily use. Beam an instant mural at the flip of switch with these imaginative bulbs!